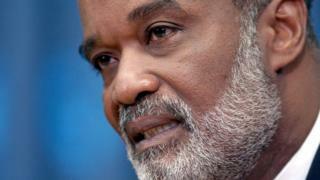 Haiti's former President Rene Preval, has died at age of 74. The cause of death is not known. In a country marred by poverty and political instability, he became the only democratically-elected president to serve two separate full terms. Mr Preval was first elected in 1995 but it was during his second term that he faced his biggest challenge. Haiti was hit by a powerful earthquake in January 2010, which killed up to 300,000 people. The quake destroyed much of the capital, Port-au-Prince, and displaced at least one million people. Haiti, which is the poorest country in the Americas, has struggled to recover from the tragedy. His government's handling of the humanitarian crisis was criticised at the time. But many Haitians have paid tribute to a leader who during his time in office improved the country's infrastructure, worked on land reform and was not accused of human rights violations. "I bow low before the remains of this worthy son of Haiti," tweeted President Jovenel Moise. Former President Michel Martelly, who succeeded Mr Preval in 2011, said he was saddened by the news. He described him as "a dignified son of Haiti". Mr Preval was born in 1943, in a rural area of northern Haiti. His father fled the country in the early days of the brutal regime led by Francois Duvalier, known as Papa Doc. He lived in New York, Italy and Belgium, where he graduated as an agronomist. Mr Preval returned to Haiti in the mid-1970s. He opened a bakery and began providing bread for an orphanage run by Jean-Bertrand Aristide, a Roman Catholic priest who would lead an uprising against Duvalier's son, Baby Doc. Mr Aristide was elected president in 1990, paving the way for Mr Preval's successful political career.